It finally happened. After 27 years of operation, the famous Olympia Looping rollercoaster has opened in the UK for the very first time. What a time to be alive. Boasting five vertical loops and forces of up to 5.2G, Olympia Looping is the world’s largest transportable roller coaster. And it certainly is huge, occupying a plot of 85 metres wide by 26 metres deep (Just think how many Miamis you could fit in that space!). 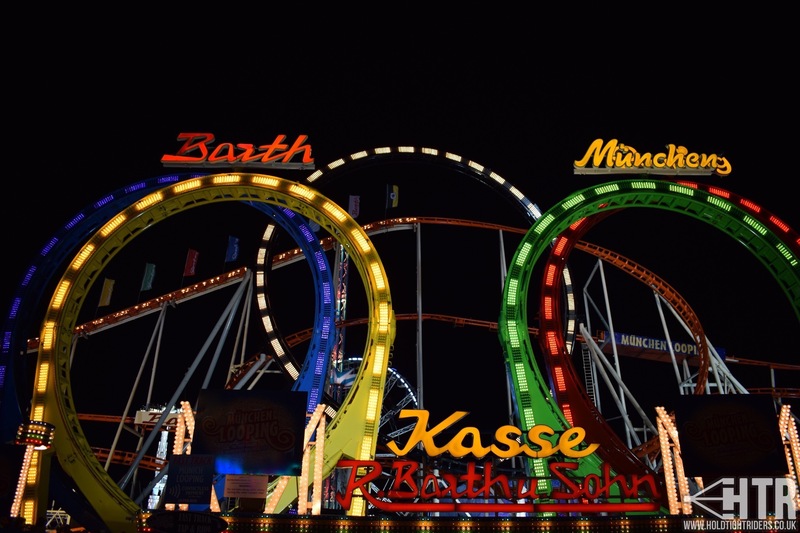 The coaster is most famous for its annual appearances at the Munich Oktoberfest, where it made its debut on 17th September 1989. But it isn’t until now, November 2016, that the coaster has ever appeared in the UK. 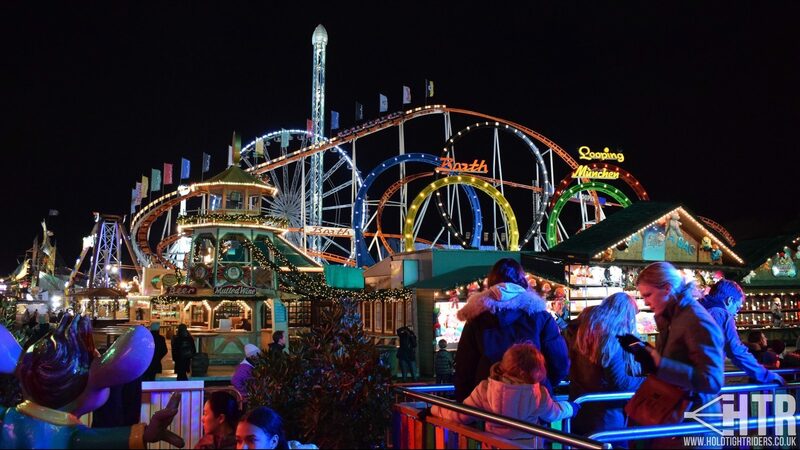 Sporting a temporary new name – Munich Looping – the monstrous ride is here to help celebrate the 10th Anniversary of the Hyde Park Winter Wonderland. Take one look at the ride in London and you’ll notice the lack of Olympic theming and new signs sporting the name “Munich Looping”. The reason for the name change is twofold. 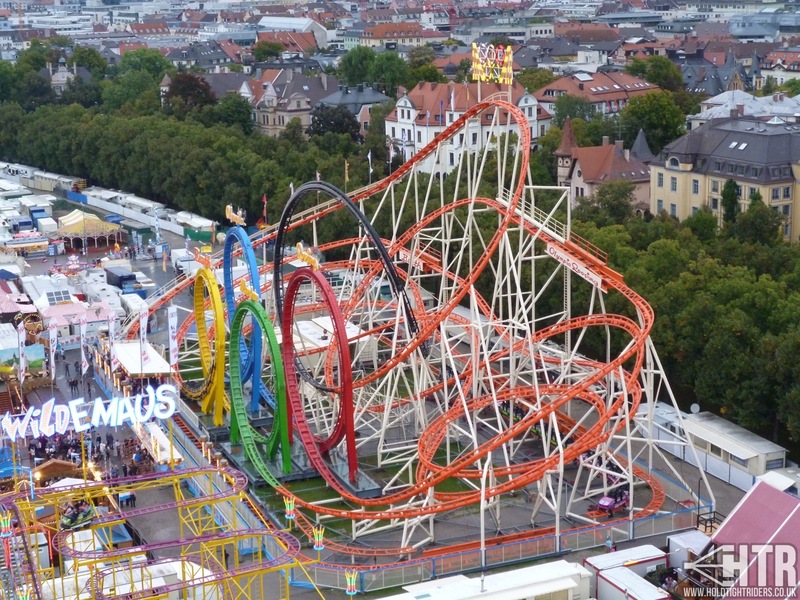 It is believed that the general (non-geeky) public are more likely to recognise the ride as being from Oktoberfest – Olympia Looping doesn’t mean much to your average Joe. Olympia/Munich Looping is a truly incredible ride. The fact that it all packs up onto trailers (over 50 of them!) and is able to be set up and dismantled in a matter of days really is impressive. Add to that the fact that it can run up to 5 trains at once and you’ve got a world-class coaster when it comes to throughputs. Whilst in London the Looping is running trains consisting of 5 cars (20 riders per train), however it’s worth noting that when in Munich they add another 2 cars to each train to form five seven car trains. Mental. How many other coasters can you name that can do that?! Believe it or not, this time last year the future of Olympia Looping was looking very uncertain. With transport and operational costs rapidly escalating, owner Rudolf Barth was rumoured to stop travelling the ride. – Barth, in an interview with Aachener Zeitung. So to see it in London is very encouraging news. Don’t miss the opportunity to ride it whilst you still can though – when it’s gone, it’s gone. The chances of seeing anything of this scale ever again on the travelling circuit are exceedingly small. A new Olympia Looping would be worth approximately 25 million Euros – an investment you simply wouldn’t be able to earn back in the current climate. Tags: Christmas, Europe, News, Off Ride, On Ride, Photos, Rollercoaster, Single Ride, Thrill Rides, Videos.